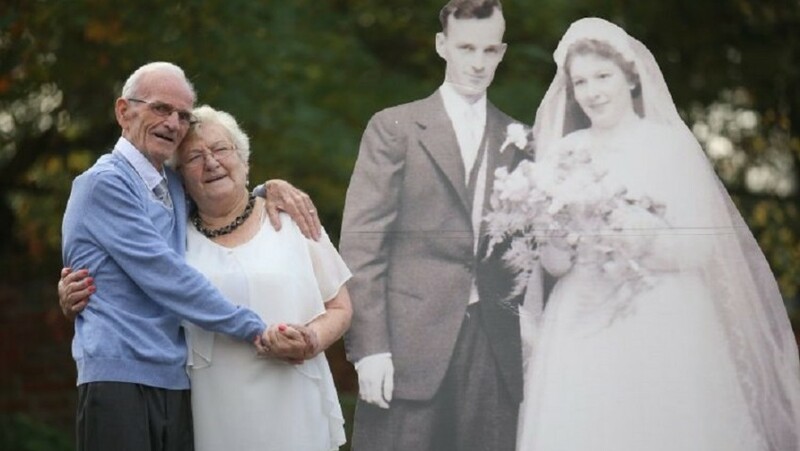 A couple have celebrating their diamond wedding anniversary – by posing next to a life–size, cardboard cut–out of themselves getting married 60 years ago. Cath, 80, and Tom Donkin, 84, who have been married 21,900 days, say the key to a successful marriage is “patience” after the pair met on a bus trip in 1951. And to mark the epic milestone their granddaughter Bryony McHale, 25, ordered them a life–size timely reminder of their first hours together as a married couple. Bryony said the cuts-outs were such a hit at the couple‘s celebratory party that everyone at the event was desperate for a selfie with a young looking Cath and Tom. But the couple, who live together in the small village of Preston, near Hull, East Yorks., were quick to point out their looks may have changed – but their love still runs deep. 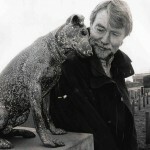 Asked how the couple met, Cath said: “I was 16 and he was 20, and I just saw him on a bus one day. “I gave him a little wink and he probably thought, ‘Oh what a silly woman,’ but we just got chatting from there. Mr and Mrs Donkin celebrated their 60th anniversary at the Haven Arms in Hedon, East Yorks., along with 90 of their closest friends and family. 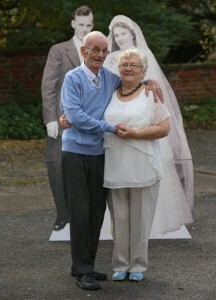 Speaking about the idea of the cardboard cut–out, granddaughter Bryony said: “I saw it online and I just thought it was a lovely way of celebrating their anniversary. “I sent the original photo to a website called My Cut Out and got them back in three days. “They were great and everyone was coming up to the cut-outs and taking photos with them all night. 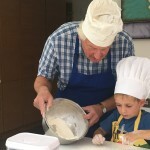 Cath and Tom originally met in Sunderland – before moving with their four children to the village of Preston in 1985. When asked what was the secret to longevity of their partnership, Cath said: “It’s just about tolerance of each other and not hurting one another. “Even when you have an argument, don’t say anything you wouldn’t like said about you.